Lack of funding and general ignorance by cultural heritage authorities is to destroy the inscription of Bisotun. Tehran, 16 October 2006 (CHN) -- Studies conducted by the executive committee of Bisotun world heritage site revealed the existence of several springs inside the mountain on which several ancient reliefs and friezes including an inscription denoted to Darius the Great, the Achaemenid king, have been carved, posing serious threats to this archeological site. This is while Iran's Cultural Heritage and Tourism Organization (ICHTO) has not yet considered any budget to protect these historic evidences. Cultural heritage experts have repeatedly warned that negligence toward the problems Bisotun is currently dealing with would result in destruction of this 2500-year-old historical site. Darius' inscription is only one of many inscriptions carved on this mountain. It marks the birth of the ancient Persian alphabet and is one of the most invaluable cultural evidences of the Achaemenid dynastic period (550 BC-330 BC). According to Abdolazim Shahkarami, geophysicist and member of Bisotun's executive committee, penetration of water into the horizontal cracks in the inscription has caused serious damages to this world heritage site. "Restoring the cracks to prevent the leaking of water, and scraping and restoring the stone slab that is located on top of the inscription to prevent the flow of water and mire onto the inscription are among the most important measures which must be taken as soon as possible to save the inscription of Bisotun. We are still waiting for the budget to start the salvation project of Bisotun's inscription," said Shahkarami. Shahkarami emphasized that restoring the stone slab which was placed above the inscription to protect it from being eroded by water is the first priority in saving the Bisotun inscription since this stone itself is being destroyed due to natural causes and needs to be repaired. According to Maliheh Mehdiabadi, director of Bisotun mega project, the request for allocation of budget to restoration works on Bisotun was submitted to ICHTO more than two months ago; however, the Organization has not responded to this request yet. Located 30 kilometers northeast of Kermanshah, the historical site of Bisotun consists of numerous valuable historical remains such as the Median Temple, Darius the Great's relief and frieze, Seleucid statue of Hercules, and the Sassanid monument of Bisotun. It is considered a unique historical site in Iran. The most important features of the complex are its Babylonian and Elamite cuneiforms. Last July, Bisotun was registered in the list of UNESCO's World Heritage Sites based on a decision made by the World Heritage Committee on its 30th session, held in Lithuania. 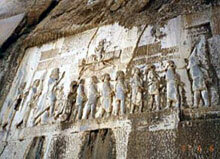 Bisotun is the 8th Persian heritage inscribed in UNESCO's list.